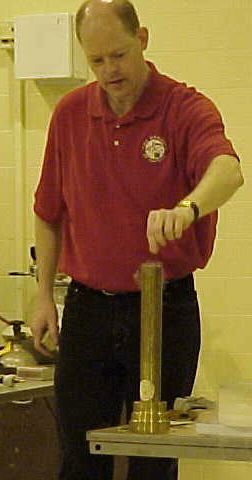 Liquid nitrogen is placed in a brass cannon with a cork on top to hold in the nitrogen molecules. Eventually, the liquid nitrogen builds up enough energy in the cannon to shoot a cork across the room. As the liquid nitrogen heats up and boils, the pressure in the cannon increases until it blows off the cork. Nitrogen is a gas in the air. In fact, air is about 78% nitrogen. Air is also made up of oxygen, carbon dioxide, hydrogen, water vapor, and many other gases in small amounts. When a gas is made very cold, it turns into a liquid similar to water. Liquid nitrogen is just very cold nitrogen. It is 320oF below zero (-196oC). It’s so cold that it freezes anything it touches almost instantly. Also, anything at normal room temperature is so much hotter than liquid nitrogen that the liquid nitrogen boils when it touches something. This is what causes the cloud when liquid nitrogen is poured into a beaker. When a balloon is put into the liquid nitrogen the air inside gets cold. Normally, when things get cold then contract, or get smaller. (Water is a notable exception and ice floats!) As the air inside the balloon contracts, the balloon shrinks. If you look closely, you can see that the air inside the balloon has turned into a liquid. When the balloon is removed from the liquid nitrogen then air inside the balloon begins to get warm again and it expands. The liquid air inside vaporizes and the balloon grows back to its original size. The tires on your car do the same thing, though not as drastically. In the winter, the air inside contracts because its cold outside. You have to put more air in to pump them up. In the summer, the air expands and air must be let out. When an object with lots of water in it, like a banana or an apple, is put in liquid nitrogen the water freezes. This is because the liquid nitrogen is much colder than 32oF, the temperature at which water freezes. The banana turns solid like an ice cube. It’s so hard that it can be used to hammer a nail into a piece of wood! The Nitrogen Cannon demonstrates how most things expand when they get hotter. Remember that liquid nitrogen is just very cold air that has turned into something like water. It has a temperature of 320oF below zero. Everything in the room is much hotter than it is. The cannon is a metal pipe, which is closed at one end. First a small container of liquid nitrogen is put inside. Then a cork is put in the open end of the cannon to make the tube airtight. Now the cannon is loaded and ready to fire! When you shake the cannon (or just hold it sideways), the liquid nitrogen spills out of its container and touches the metal pipe. The cannon is warm (relative to the nitrogen) and the liquid nitrogen turns into nitrogen gas very quickly. The liquid nitrogen boils, just like water on a hot stove. When things get hot, they expand. For example, if you put a lid on a boiling pot it jumps around because the hot steam takes up more space than the hot water. The nitrogen gas expands very quickly and the pressure inside the cannon gets so high that the cork blows off. BOOM!